Restoration Services and O.E.M. Replacement Wooden Dashboards and Interior Trim On Earth! Below is a "Mirror Image" of our Jaguar Page....for general reference for Daimler owners....we hope we haven't offended you by leaving all of the references "Jaguar". 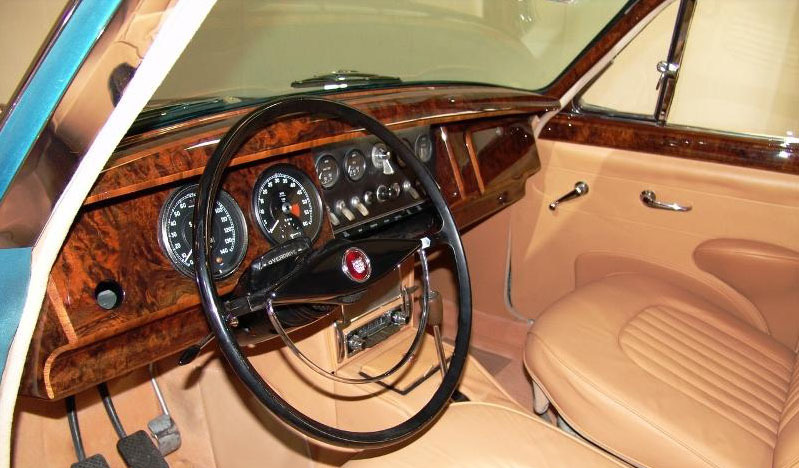 Daimler produced fine automobiles in England beginning in the early 1990's, and like all of the fine marques manufactured by the British craftsmen, they came with interior woodwork. The Daimler Company was eventually purchased by Jaguar Cars in 1960 and used the Daimler name on various models until 1966. 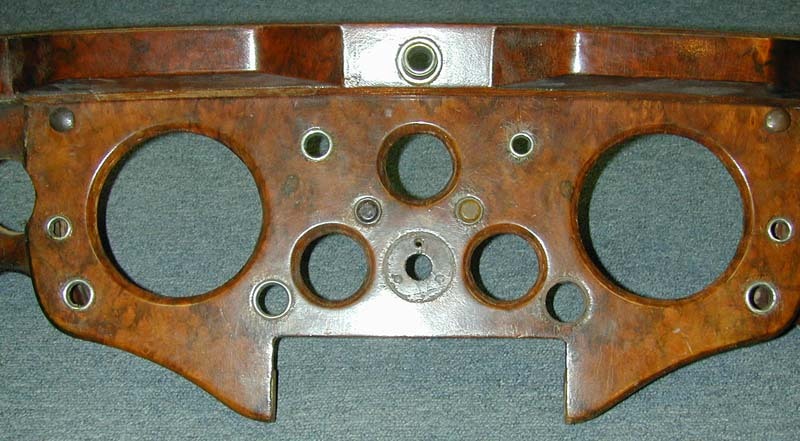 No offense to Daimler or Daimler owners, but because of this connection and woodwork similarities, this page is an exact "Mirror Image" of our Jaguar page. We did this so that owners of Daimler Automobiles will know that we can restore their woodwork ! 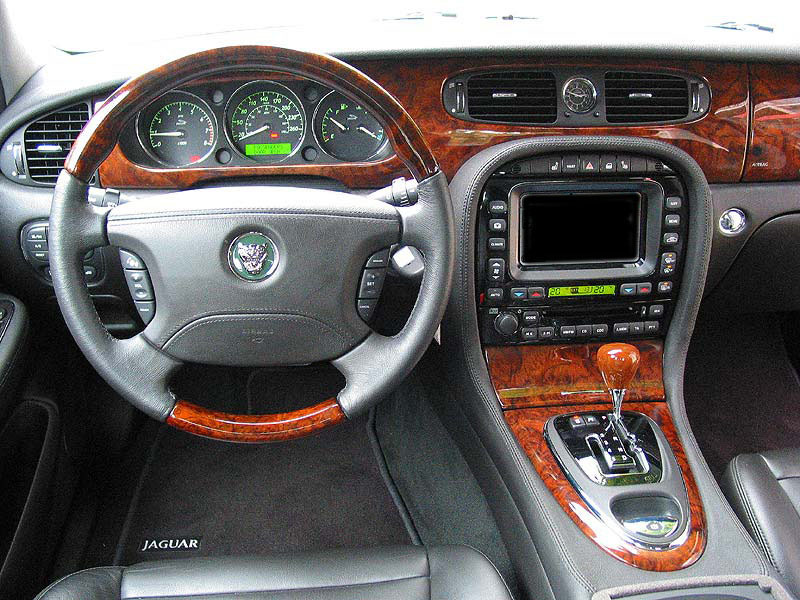 We can restore your Jaguar woodwork ! Throughout their history, Jaguar has offered some of the most beautiful and complex wood appointments ever found in automobiles, and that tradition continues with the models Jaguar produces today. We at Madera Concepts are proudly dedicated to doing our part in maintaining the Jaguar “Heritage” by helping you get the wood trim in your Jaguar looking “Showroom New”. As you may have learned, there were many "in production" modifications, especially in the early years and the wood found in some models was totally unique to that particular vehicle. That being said, we have done our best to properly identify the wood you see in our Jaguar section, based on the information we were given. Likewise, we may not have been sent all the wood for a particular model and those parts are not pictured. However, if you know something we don’t, please let us know and we will make corrections and additions. If you have photos of Jaguar woodwork you’d like to share with the world, please let us know. Also, due to time constraints, we were not always able to take “after” pictures in our shop and in order to get “in car” pictures we had to depend on our customers taking them, and sending them to us....which most of the time they didn’t. Therefore, for many models, we have “before” restoration pictures, but we do not have “after” pictures. However, if you open various pages in our site, you will see many “after” pictures that will give you an idea of what we can do for you!!! We at Madera Concepts are proudly dedicated to doing our part in maintaining the Jaguar “Heritage” by helping you get the wood trim in your Jaguar looking “Showroom New”. If the wood in your Jaguar is showing its age, give us a call, we are at your service! There are just so many years and models of Jaguar, that we cannot begin to address them ALL here...and of course we’ll add to these pages as we can. Since our founding in 1982, we have restored wood from nearly every year of Jaguar, including the newest models. Here are just a few of the hundreds of Jaguar Year & Model combinations that we could show you. CLICK on a model, or scroll down the page to see all. Please keep in mind, we can restore the woodwork from ANY year or ANY model. We thank you for visiting our site and for your interest in Madera Concepts Automotive Woodwork Restoration Services. 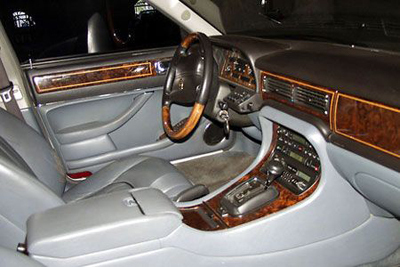 But before we explain how we can help you get the wood trim in your Jaguar looking “Showroom New”, we must pay homeage to the “Masters” in Jaguar’s wood shop that are a very important part of the “Jaguar Legacy”. As you well know, the wood trim in your Jaguar is a “Work of Art”. . . . the craftsmen at Jaguar painstakingly create the wood trim for each car . . . and yours is special!! They select beautiful wood veneers and carefully arrange them to obtain the best grain patterns. They pay particular attention to how each part relates to the next . . . obtaining the best match possible. Your woodwork was then “finished” and polished. 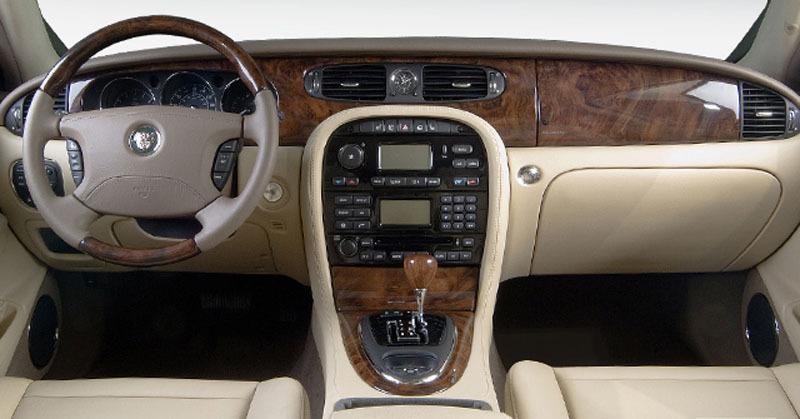 The wood trim in your Jaguar is unique to your car, no other Jaguar has the same wood grain pattern and color as yours! We thank all of them, for the beauty they add to our world !! Now, to why you might be here, and how we can help you. Call us Today, we are at your service !! We manufactured this one in a beautiful Burled Walnut. (note the camera flash made the wood on this dash set look a lot lighter than it really is....the picture below is from the same set...and the color in that picture is quite accurate. We have manufactured this O.E.M. replacement for over 20 years and it is the ONE improvement every Jaguar Series I owner must have. BUT, don ’t forget your door rails, they need a facelift too !!! We can either stain and refinish them to “compliment” your new dash, OR, we can reveneer and refinish them to “match” your new dash. We have manufactured this O.E.M Replacement Dash w/ Glove Box Door Package for over 20 years. They are absolutely gorgeous. Below is a view of the back of the Glove Box Door. As you can see, there is a relief cut on the outer edge and at other strategic places, which is necessary for the Vanden Plas. Non Vanden Plas models do not have these relief cuts. 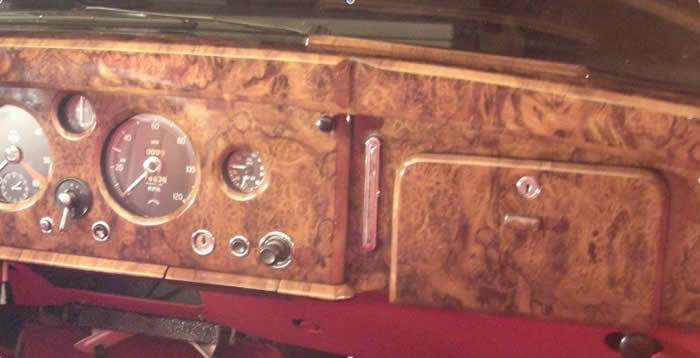 Please keep in mind that Jaguar Series II and III vehicles had other woodwork that should be restored at the same time you order your new Dashboard. Specifically, there is a Trip Computer Panel, a Shift Console Panel, two Front Door Panels and two Rear Door Panels. We would be more than happy to help you choose the best course of action, so give us a call and we'll go over your parts with you. On the left is what a Jaguar XJ Series III console can look like after years of exposure. On the Right is what a Jaguar XJ Series III Console can look like AFTER we Reveneer and Refinish it ! The veneer we used, mirrors the Burled Walnut that the factory chose for these models. Above is another Jaguar XJ Series III Console that we Reveneered and Refinished. This console matches a New O.E.M Replacement Dashboard that we manufactured for our customer. Generally when we manufacture a new dashboard, we use a Burled Walnut with more "Burl" character, and this Console was veneered to match that. It is very common for Jaguar XJS owners to send us their woodwork for Restoration, so if the woodwork in your XJS is showing it's age....We can restore it for you and it will look "Showroom New". Here is an XJS set that we Refinished. This is the Burled Walnut that came from the factory. Click Here to see what it looked like when it came in. Occassionally we'll get a Jaguar XJS owner who wants a new and different look, and we are more than happy to accommodate !! We pay attention to details: "book-matched" Shift Console Panel, "book-matched" and "matching" Front Door Panels, and matching Rear Door Panels, that match the Front Door Panels. This set Below, was sent to us with some special requests from the car's owner. Originally the radio panel and the shift console panel we covered in black vinyl, as was standard on some years. We fitted the console with a custom filler plate for two gauges and then we Reveneered all of the panels in a gorgeous Carpathian Elm Burl. If the woodwork in your Jaguar XJS is showing its' age, we would be more than happy to help you choose the best course of action, so give us a call and we'll go over your parts with you. YES, even E-Type owners are drawn to our woodwork !! 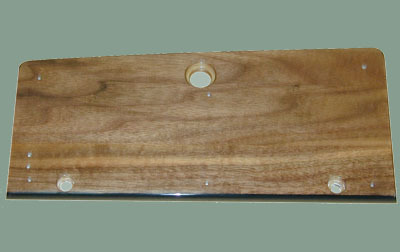 On occassion, we get a call from an XKE owner who "Just has to have" our woodwork in their Jaguar XKE. 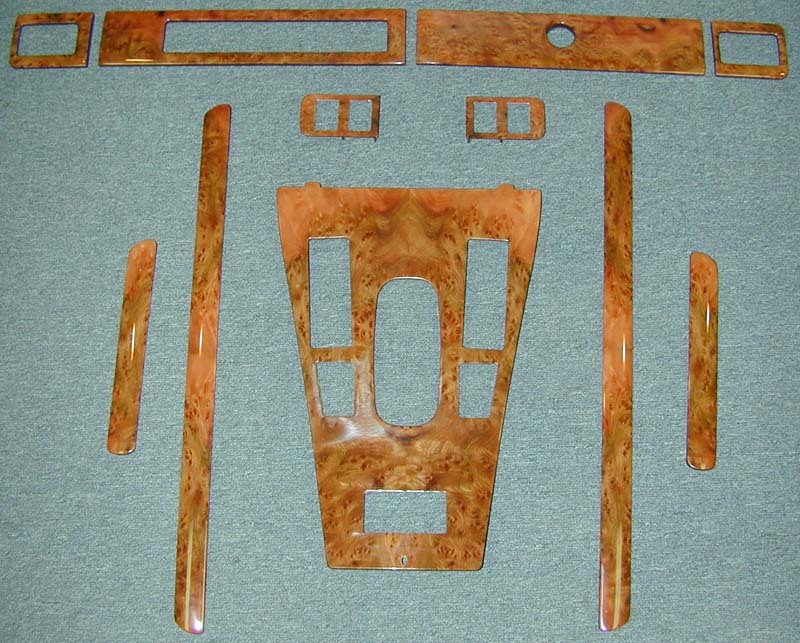 An E-Type owner had us manufacture them the parts you see above in a beautiful Burled Walnut. They even brought us their metal parts and paid us to mount the woodwork to it. As you might guess, our customer was so excited to get their woodwork, that once we told them their parts were done, they were waiting at our door when we opened the next day. We apologize for the picture quality....we didn't realize our shot was so blurry....BUT it should give you a pretty good idea what the Burled Walnut set looks like....as compared to the Carpathian Elm set pictured Below. Here are parts we did for another E-Type owner. Not olnly did we manufacture NEW Dashboard Panels for our customer in a beautiful Carpathian Elm Burl, but per his request, we made a new Radio Panel, we refinished his Steering Wheel and we Reveneered the two Speaker Rings he sent. Our customer is going to take our parts off the stock sub-structure and repaint the black and clean up the switches prior to installing them in his car. If your woodwork is starting to show its' age - your interior will come alive after we restore it for you. !!! What a gorgeous interior !! We are proud to do our part in keeping the Jaguar "Heritage" alive and well !! Above is a set we have completely Refinished - Ready for you to buy...!! Above is another set we have completely Refinished - Ready for you to buy...!! 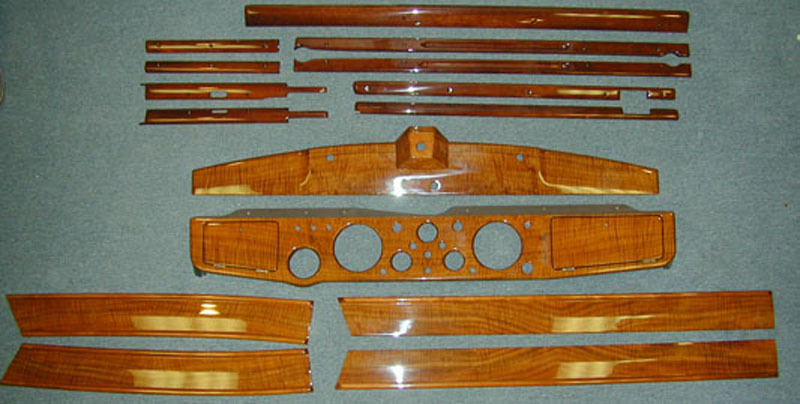 We can Refinish your XK8 woodwork, we recommend that you send us your entire set all at one time. We also have some of these sets already Refinished and are available on "core exchange" basis. Above is what the woodwork looks like After we restore it. This set had turned Very Reddish Yellow in color....and even after we restored it....the very Red hue remained. Above is an XJ8 After we restored it. You can see that it did not get much exposure to light, and so when we restored it, it went back to almost the original color it was when it was new. Send us your woodwork....and we'll restore it back to looking "Showroom New" !!!! 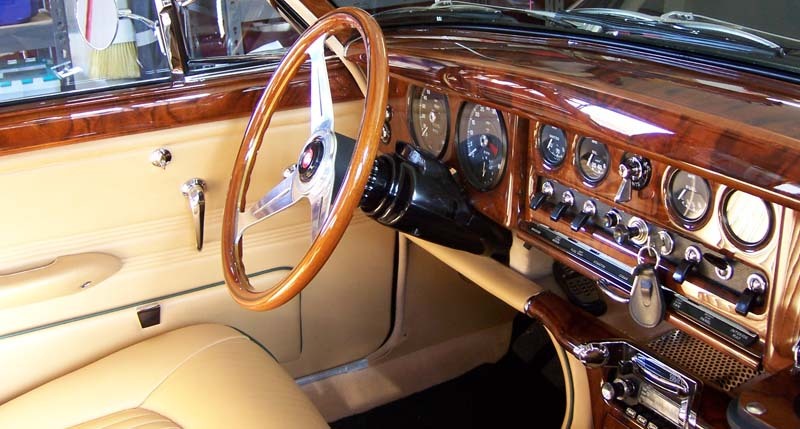 The woodwork found in the Jaguar Mk I thru Mk X models was some of the most beautiful woodwork offered by a car manufacturer. The various Mk's were manufactured from 1938 to 1967 and each series had various differences from the chassis up. Often the differences were small changes like an engine size increase and other times, the changes were complete redesigns of the model. Since 1982, we have restored dozens and dozens of these sets, and the results have been incredible. Regrettably, most of those sets left our facility without us taking pictures. We will continue to add pictures of the woodwork when we can. Below is a stock set of woodwork from a 1938 Jaguar Mk IV, sent to us for complete restoration. The condition of this set is pretty typical of woodwork from this era, and has surrvived pretty well despite its' age. We will be Reveneering and Refinishing it. Our customer has marked all the problem areas ie; Numerous splits and cracks, missing wood and extra holes that they wanted us to address. The two door panel strips in the bottom of the picture are from just one side of the car. The ones from the other side, had been lost years ago, and so we made two new ones for our customer. Below is a full set of 1959 Jaguar Mk I woodwork that we own, and is For Sale. It has not been restored and it is in very good structural condition. If you look closely, you can see that, it has most of the hardware attached to it. Of course, you would want us to restore it for you. We also have the rear glass from a Mk I...it is in great shape...so call us if you need one. Below is a Set of woodwork from a 1948 Jaguar MK I V that we Reveneered and Refinished. 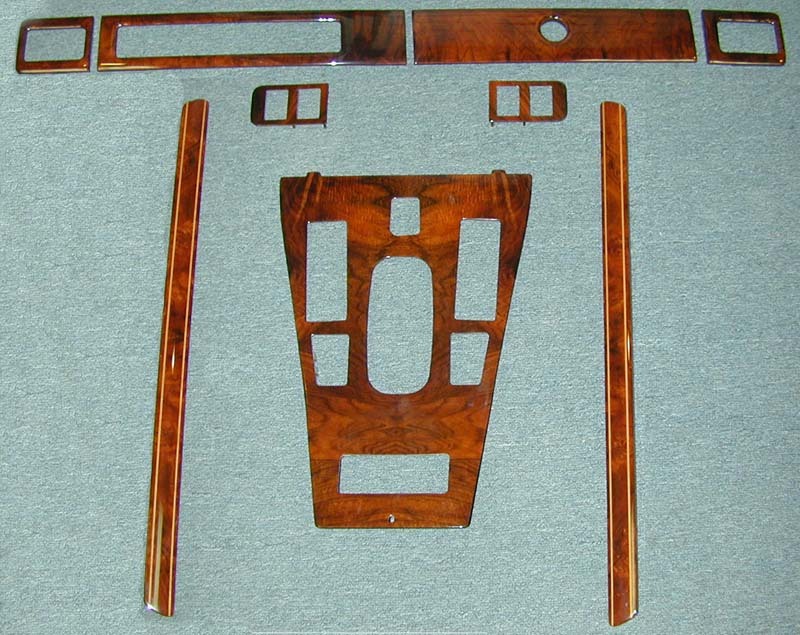 Above is a "stock" set of Jaguar Mk V woodwork after we Refinished it. 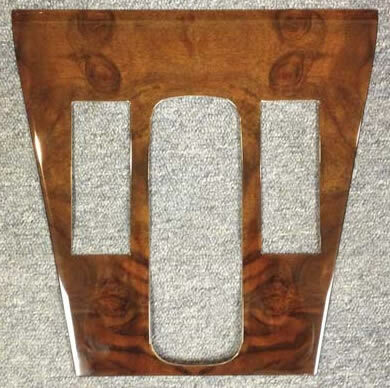 The contrast between the solid wood borders and the veneered inner portion adds a beautiful touch on the door panels of this Jaguar Mk V woodwork. This is a set of 1963 Jaguar Mk II Saloon woodwork before we restored it. Above you can see the same 1963 Jaguar Mk II Saloon woodwork before we restored it. Our customer had us use Burled Walnut. Here is a close up of the Dash Gauge Panel BEFORE we restored it. Now you can see how gorgeous this same 1963 Jaguar Mk II Saloon Dash Gauge Panel - AFTER we restored it. Here is a close up of the Glove Compartment Door BEFORE we restored it. Now you can see how gorgeous this same 1963 Jaguar Mk II Saloon Glove Compartment Door is - AFTER we restored it. Notice the beautiful "bookmatches" that we did in the veneer on the Dash Cap (above) and the Door Panels (below) from this same 1963 Jaguar Mk II Saloon. When it comes to the restoration of the woodwork from your Jaguar - you can trust Madera Concepts to get it right. This is a full set of 1953 Jaguar Mk VII woodwork that was sent to us for restoration. Check out the left end portion of the dashboard is completely broken in half !!! Check back for After pictures. We did a complete Reveneer and Refinish Restoration of this 1960 Jaguar Mk IX woodwork. 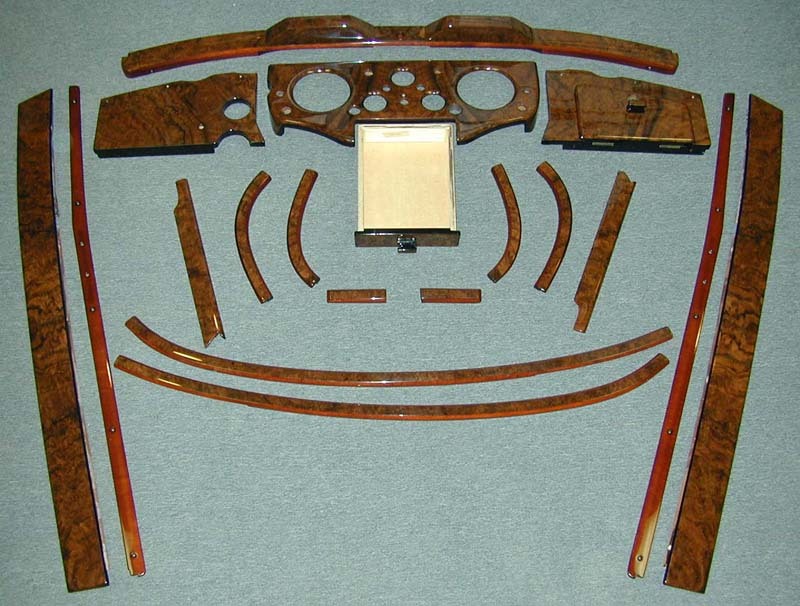 The Jaguar Mk IX had a gorgeous "crossbanding" on many of the veneered parts. Above is a picture of the end of the Dash Cap. Our craftsmen were proud to duplicate the fine detail and beauty that was originally on this woodwork. 1960 Jaguar Mk IX woodwork is one of the more complex sets that the craftsmen a Jaguar created. We take a great deal of pride in restoring it back to "showroom new" condition. 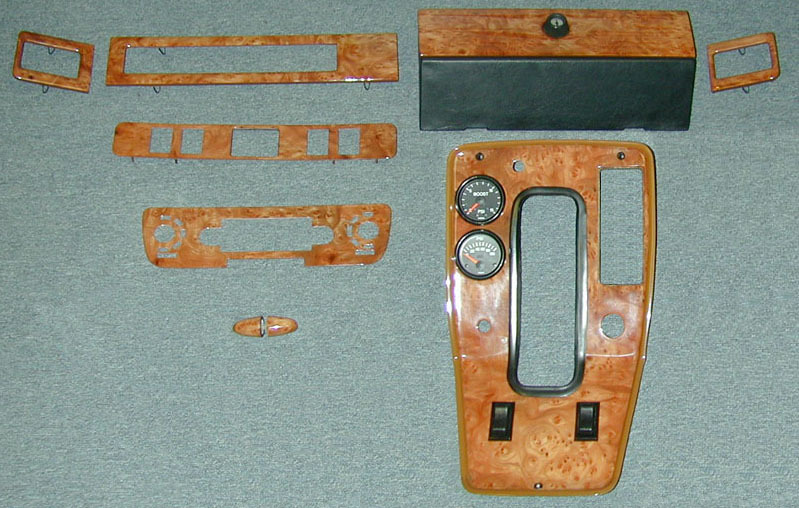 The Jaguar Mk IX woodwork had crossbanding on many parts and is the perfect accent to the interior. Of course, when we Reveneered this set, new crossbanding was utilized. The console of this Jaguar Mk IX is one of the most unique and complex consoles we have had the opportunity to restore. The twin curved accents posed tremendous veneering challenges, but Our craftsmen were up to the "challenge" and the results were incredible.....our customer was very pleased ! We restored all of the woodwork from this 1966 Jaguar 3.8S-Type Saloon for Mr. Iain L. O. Buxton. He loved our work and sent us this picture of the woodwork installed back in his car. Mr. Buxton entered his car in the June 2011 JCNA Concours D ’elegance and scored 100 pts. When your Jaguar XK 120 or Jaguar XK 140 woodwork starts to show its' age, send it to us and we'll restore it for you. This Instrument Panel will be Reveneered and Refinished by us. When the stock dash is falling apart like the one below, we can manufacture a new one !! New Veneer, New Crossbanding and a New Finish.......What a Difference !!!!!! 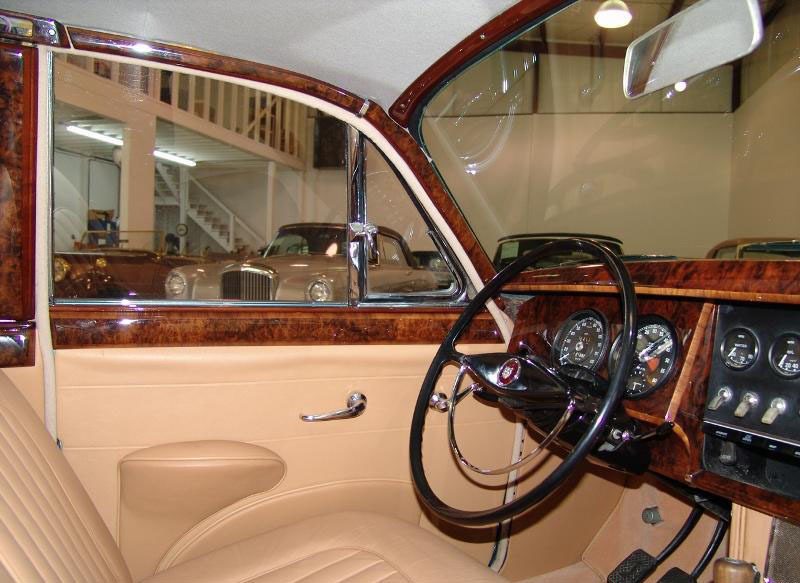 We Reveneered and Refinished all of the woodwork in this Jaguar Mk II 3.8. What an incredible difference!! We Reveneerd and Refinished the set below. By this time, most Jaguar Mk II woodwork needs to be both Reveneered and Refinished. Above is the full set of woodwork from a 1962 Jaguar Mk II 3.8 - AFTER we Reveneered and Refinished it. The "Bookmatching" on these 1962 Jaguar Mk II 3.8 Mk II Door Trim Panels and the picnic tables is absolutely gorgeous. No one does it better than the craftsmen at Madera Concepts. Click Here to see More Pictures of this set.